While swimming in your pool during the summer is fun, it is essential to make sure that your little ones are not able to fall in and hurt themselves if you are not outside watching them. With a few months left of summer, your kids will still be playing in the yard for many weeks until the start of the school year. For this reason, it is especially important to invest in a well-constructed child safety fence to keep your kids safe as they enjoy your outdoor space. If you are looking to add a fence to your yard, consider the many reasons to add a child safety fence to your landscape. Your kids should always enjoy spending time in your yard. However, it is also important to keep an eye on them to ensure that they are safe as they are playing and running around. With a child safety fence, you can increase the privacy of your outdoor space as well as prevent potentially dangerous unwelcome visitors or wild animals from entering your property while your kids are outside. Although your neighborhood may be safe, that does not always mean that the entire surrounding area is as well. 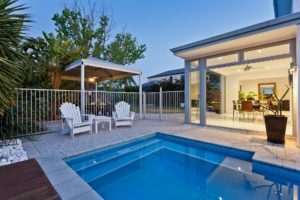 Another reason to consider a safety fence for your home is to safely keep everyone inside of your property, especially if you worry about younger kids wandering into potentially dangerous parts of the surrounding area such as an unwatched pool, road, or pond. By ensuring that your fence is not easily climbed or moved, you are also making sure that it does not lead to trouble for your kids or pets as they play in your yard. While swimming in your pool during the summer is fun, it is essential to make sure that your little ones are not able to fall in and hurt themselves if you are not outside watching them. Installing a fence around your pool is a great way to keep your kids safe as they run around your yard. For a safety fence surrounding your pool, aluminum is the best material to trust. Are You Ready for a New Fence in Your Yard?